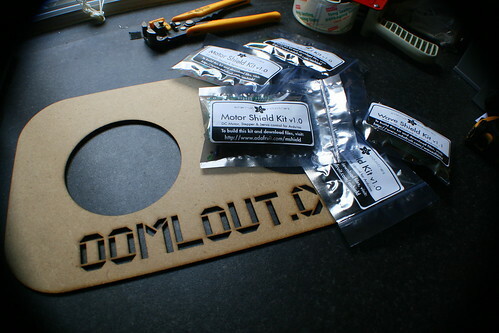 At oomlout we fill our days trying to develop the funnest open source products we can. But we are not alone in this pursuit, there are others online and off questing to do the very same. Sadly these companies are often Japanese, American, and occasionally even Belarussian. These locations making it difficult for those of us based in the UK to get speedy access to their products. Well no more (well no more for a few), when we dicover these gems we do our very best to rectify this situation and today we are excited to announce our first distributed products. 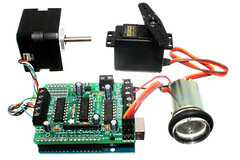 Allows you to connect up to 4 DC motors or two stepper motors (4, 5, 6 or 8 wires), and two hobby servo motors, to your Arduino. All controllable through an easy to use software library. 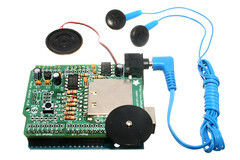 Have your Arduino play any recorded sound off an SD card. Plays up to 22KHz uncompressed audio files. Simply load the .wav files you want onto the SD card, download the easy to use software library, and have your next project beeping, ringing, or even speaking. Great if you have more ideas than Arduinos. 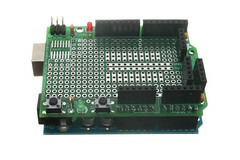 Allows you to solder up a project without having to dedicate your Arduino to it. Also compatible with our 400 point breadboards, remove the rails and the breadboard will fit on top.